Which Industries Benefit From Plastic Injection Molding? When it comes to plastic injection molding manufacturers, each has something unique to offer. Because differences exist from one company to another, it is important to select one with a reputation for delivering superior-quality profiles at an affordable price. Injection molding companies provide a much-needed service to a broad range of industries and for multiple applications. The manufacturer uses either pellets or granular plastic resins to produce finished products with extreme precision. The process involves using different types of resin, including polystyrene, polycarbonate, polypropylene, polyethylene, acrylic, polyvinyl chloride, and others, based on the customer’s specifications. The plastic injection molding material properties play a critical role in the quality of the finished part or component. For that reason, the best manufacturers work with trusted suppliers that provide high-quality raw material. With that, the end profile meets the customer’s specifications and tight tolerances. The injection molding process consists of several stages. In simple terms, these phases include clamping and injection, solidifying and ejection, and quality control. The melted resin injects into the cavity of a mold that represents the size and shape of the finished profile. Once the plastic cools and hardens, it ejects from the mold. At that point, an expert checks the product carefully for any aesthetic or functional defects. Due to precision, cost-savings, quick turnaround, repeatability, large volume production, and other factors, plastic injection molding is a diverse solution for a multitude of industries. Agricultural – Because this cost-effective process produces products capable of withstanding humidity, impact, and both high and low temperatures, it is ideal for the agricultural industry. A manufacturer can use UV additives to enhance the plastic’s ability to withstand harsh weather conditions and exposure to corrosive substances. Automotive – This process makes many different interior and exterior parts for automobiles. Some examples include radio controls, bumpers, cup holders, and dashboards. Children’s Toys – Top injection molding companies make the toys that children play with, including things like Frisbees, yo-yos, games, car models, doll houses, and more. Construction – For the construction industry, this process makes insulators, raised flooring panels, deck fasteners, roofing vents, railing gaskets, conduits for concrete beams, and more. Consumer Goods – For items like barbecue accessories, toilet seats, bird feeders, fishing tackle boxes, racks for storing skateboards, hair combs, and more, manufacturers rely on the plastic injection molding process. 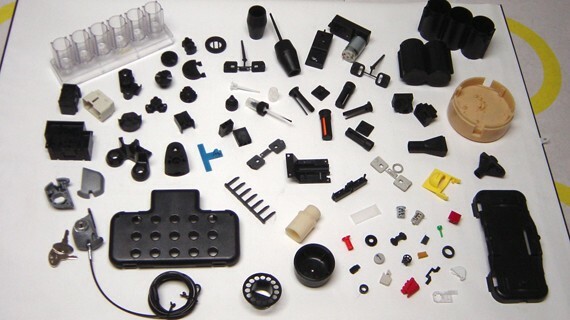 Electronics – Injection molded plastic creates housings for various devices. Entertainment – The DVDs that people watch on their TVs and the CDs they listen to come from this molding process. Food and Beverage – Manufacturers can create bottle caps, lids, containers, bread trays, high-temperature serving pans, and a host of other items for the food and beverage industry. Housewares – Finished products include drinkware, containers, mopheads, flower pots, trash cans, recycling bins, units to hold cans of air freshener, and so on. Medical – Along with containers, plastic injection molding results in numerous devices, including braces, monitors, syringes, and other items used by patients and medical professionals. Switches – The switches used to turn lights, the garbage disposal, fans, and other things around the house on and off also come from this molding process. Sporting Goods – Everything from training devices to exercise equipment is made from the injection molding method. If you need any of these products made or something different, we can help. RPM Industries, LLC has more than 30 years of experience in creating plastic injection molded profiles. Call today to learn more.